Two Saturdays ago I helped sort 7,000 Thanksgiving pies sold as a fundraiser for one of my favorite DC nonprofits, Food & Friends. In case you were wondering, 7,000 pies looks like this about 6-times! This pecan pie recipe is poco complicado, but as you read and mentally prepare yourself to recreate its splendor, if you ever think you’re ready to “next!” this recipe, take a deep breath and remember you’re only making one…not 7,000! Before we get into the thick of it, there are a couple of things you need to know. 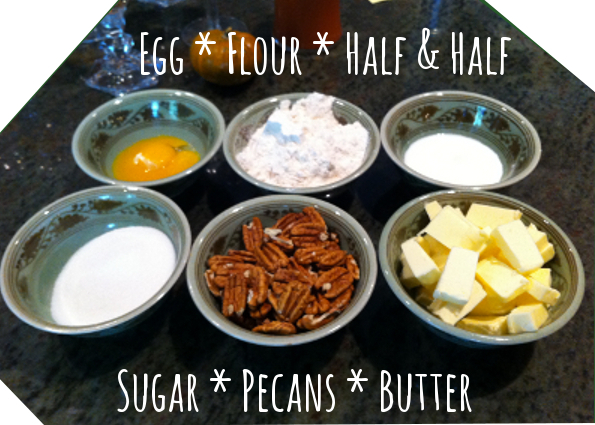 This is a recipe for Pecan (“pi-con”) Pie not “pee-can” pie. Few alliterative phrases irk my ears more than “pee-can” pie, and this is coming from the girl who has her own fair share of Texas twists on pronunciation. 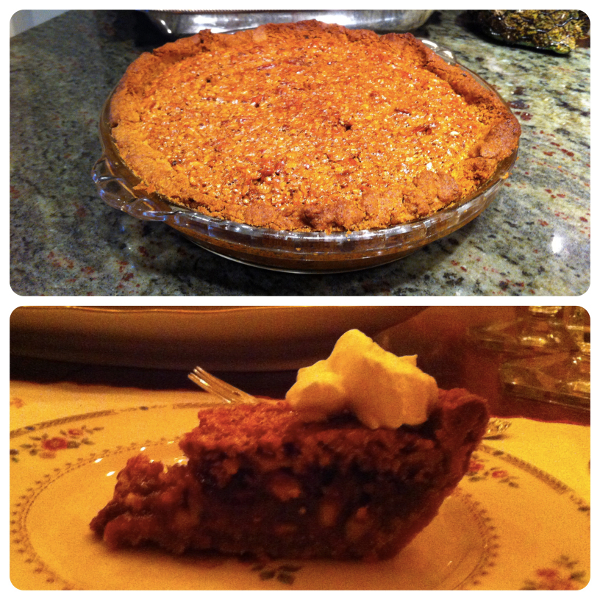 This pie was extra special because it was made entirely from the fruits of one of Mimi & Papa’s pecan trees! This is my first attempt at a Pecan Pie, but you should know Goode Company Pecan Pie (GCPP) is and always will be the gold standard for this species of pie. Important characteristics worth mimicking in GCPP are: a crumbly crust, whole pecans, and balance in the crust & nuts that cuts the saccharine filling. Let’s start with the crust, shall we? First pulse your cup of pecans & sugar in a food processor; pulse until it’s a fine meal. Add flour, butter & salt and continue to pulse until the butter is super crumbly. Then add the eggs and half & half. Once your dough is in a nice ball, flatten it out between two pieces of parchment paper. Chill in the fridge until you’re ready to bake it. When it’s time to bake, roll or use your hands to fit your crust into a pie pan. Be sure to poke your crust with a fork (many, many times) and then bake for ~20 minutes at 350. I covered mine with parchment paper. True story, I didn’t have pie weights and my crust definitely rose a little. Once it got out of the oven, I needed to smoosh it back down to its home in the pan. Remove once it’s golden brown. While your crust is baking is the perfect opportunity to make your filling! 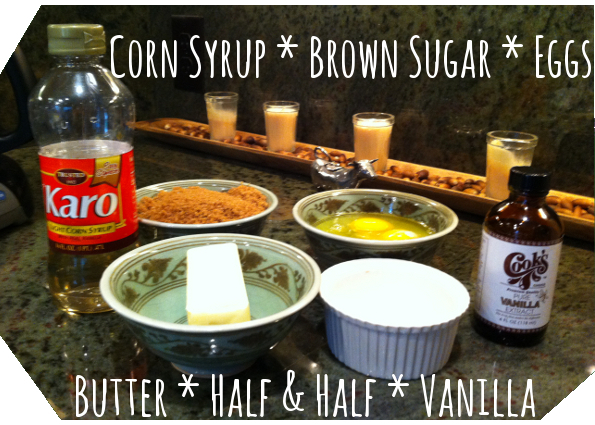 Setup a double boiler and melt your butter. Then mix in your sugar & salt. Then beat in eggs, corn syrup, and vanilla. Pop your bowl back on your double broiler & stir, stir, stir until your mix is shiny and warm. Remove the bowl from the heat & stir in your 2 cups of toasted chopped pecans. Ta da! You have filling. Now this is exciting. Take your toasted whole pecans and pop those little guys on the bottom of your crust. Drizzle dulce de leche all over the pecan-filled pie crust. Then pour in your filling. Alas! It’s time to bake this baby. Pop it into your still hot 350 degree oven for 35-45 minutes or until your pie filling stands up to a toothpick test. Let your pie rest until it’s time for dessert (or an extra decadent afternoon treat!). I garnished ours with some Grand Marnier whipped cream & it was the perfect cream to cut the sweet.